Home Obituaries James Kirk Finley Sr.
James Kirk Finley Sr., beloved father passed away on Monday, April 8, 2019, at Memorial Hermann Health System in Houston. He was 65. James was born October 9, 1953, in Liberty, TX to Harrison Kirk Finley Jr. and Annie Ophelia Armstrong. He lived in Liberty all his life. James enjoyed watching old western T.V. show with his favorite being “Gunsmoke.” He looked forward to the football season and horse racing. He had the knack of picking winners. Family and friends remember James making the best chili around. James will be greatly missed by all who knew and loved him. James was preceded in death by his parents. James is survived by his son, James K. Finley Jr. of Hardin; daughters, Kimberly Ann Finley of Hardin and Tina Lynn Finley of Hardin; brother, Bruce G. Finley and wife Rebecca L. of Hardin; sisters, Roseann Blanchard and husband Chris of Hardin and Patti Finley of Hardin; stepmother Patricia Finley of Hardin. Grandchildren, Alexis Finley, Blake Finley, Haley Minjarez, Grayson Molina, Gabriel Molina, and Cayden Finley; Great-grandchild, Leeson Zbranek and a host of family and friends. 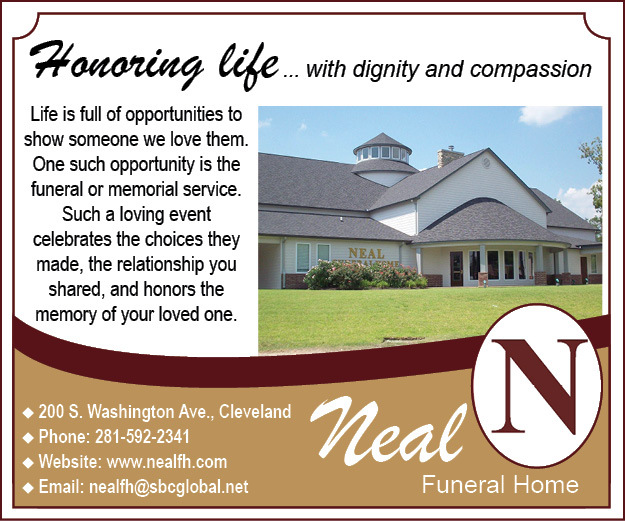 A service of remembrance will be held Friday, April 12, 2019, 2:00 P.M. at Faith and Family Funeral Services Inc. 40847 Hwy 105 East, Batson with Pastor Woody Sonier officiating. Interment to follow at Finley Cemetery in Hardin. Serving as pallbearers are Tony Locke, Chris Blanchard, Kirk Spears, John Bardwell, Blake Finley, and Robert Smith. Honorary pallbearers are Eric Valkner and Devin Black. James family will be receiving friends Thursday, April 11, 2019, from 5:00 P.M. until 8:00 P.M. at Faith and Family Funeral Services Inc.